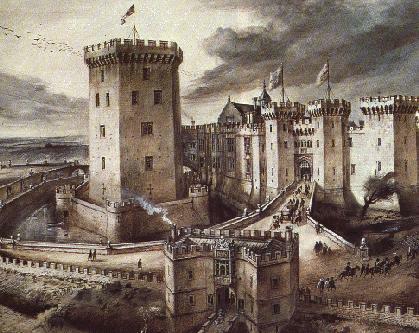 Below is an a artist's view of Raglan Castle as it may have appeared in the early 17th century. The castle had reached virtually the height of its development under the third earl of Worcester, with the niches of the moat (left) and White Gate (foreground) as the only significant later additions. (Illustration by Alan Sorrell, 1959 from the Cadw guidebook for Raglan Castle. The photo is also a "clickable image map," which means that by clicking on different areas of the photograph you'll be taken to pages providing close-up deatils and explanations for that section of the castle.